Word is in: the rough cut of the London Plane transplant video I’ve been working on will be showing at the Foti Tree and Landscaping booth at New England Grows tomorrow, Thursday, and Friday. 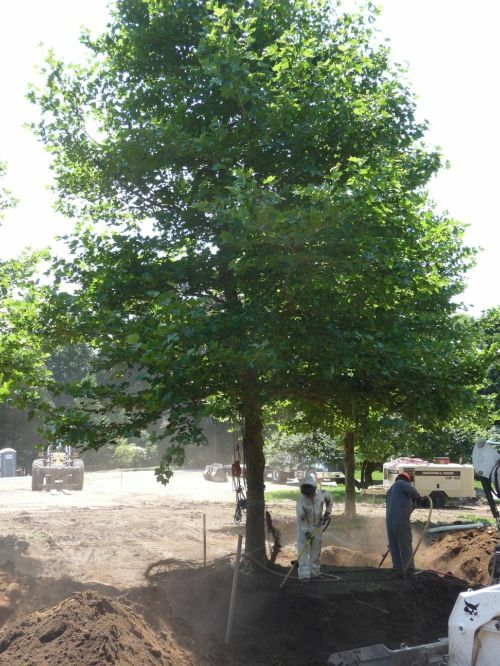 If you want to take a look at how these guys moved five very large (12-14″ caliper, 30′ high) London Plane trees bare-root last summer, stop by the booth, which is #2850 on the expo floor. The process astonishing. The sight of a fully leafed-out mature tree, in all its bare-root glory, travelling across a construction site fully upright on the forks of a front-end loader is amazing. Bring your own popcorn; the video runs about 29 minutes long. Blowing soil out from the first London Plane root mass, prior to moving.